This case is a simple wrap around case that protects the sides of the device. It is designed using System Wear’s custom made high-density foam material. 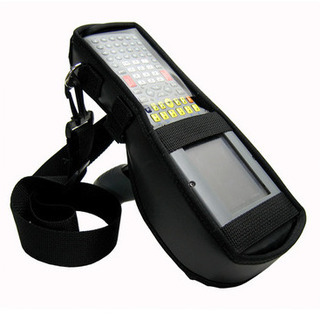 It includes a flexiclip, clear plastic protection over keypad and a shoulder strap. It is ideal for all environments including Policing and Security, Warehousing, Manufacturing, Retail, Resource Industries, Logistics and Transportation. Case offers protection at all times, whether it is in use or attached to the optional swivel belt holster. Can easily be mounted to a lift truck when combined with the optional mounting pad. Shoulder strap and flexible clip gives the user different hands free carrying options.. Comfort and ease of use ensures that the scanner is kept on the employee, thereby preventing loss and damage to the device. Can be customized to specific environments, as can all other scanner case designs.